Jose María Jiménez Sastre (February 6, 1971 in El Barraco, Spain - December 6, 2003 in Madrid) was a professional road bicycle racer. His nickname was "El Chava". When he turned professional, Jiménez was considered a potential successor of Miguel Indurain. He won the points jersey (2001) and the mountains jersey (1997–1999, 2001) of the Vuelta a España, finishing 3rd overall in 1998, 5th in 1999, and 17th in 2001. He often attacked without considering the consequences, which sometimes resulted in spectacular wins in the toughest mountain stages. 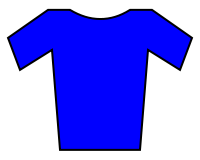 During stage eight of the 1999 Vuelta a España Jiménez attacked the 23% grade of the Angliru in rain and fog to catch Pavel Tonkov's long solo break at the line and take the stage in a two-man sprint. As he crossed the line, he did not have the energy for the victory pose. It was the first time in the history of the race that the Angliru was used. However, he would subsequently pay for his attacking style in the next stage, where he would often lose by 10 or more minutes. Jiménez received psychological treatment for depression, and retired from professional cycling in 2002, at which point he got married. He died of a heart attack in a psychiatric hospital in Madrid at the age of 32, in December 2003. Spanish cyclist Carlos Sastre is Jiménez's brother-in-law. ↑ "Cyclisme - Jose Maria Jimenez meurt d'une crise cardiaque". Associated Press (in French). Le Devoir. 8 December 2003. Retrieved 10 August 2012. ↑ Martin Hardie (8 December 2003). "A tribute to Jose-Maria Jimenez". Cycling News. Future Publishing Limited. Retrieved 19 September 2012. ↑ Henry, Chris (8 December 2003). "José Maria Jimenez dead at 32". Cycling News. Future Publishing Limited. Retrieved 10 August 2012.